Securehost Review 2019: Is Securehost a Good Hosting? Securehost is a website hosting provider based in Israel. The firm provides an array of hosting solutions including: shared hosting, reseller hosting, VPS, and dedicated servers. With its two data centers located in Israel and the Netherlands, Securehost is well equipped to offer shared hosting, VPS, reseller hosting, and dedicated server solutions to its clientele in Israel and beyond. It has its offices in Ashdod, Israel and has been in the hosting business for more than eight years. 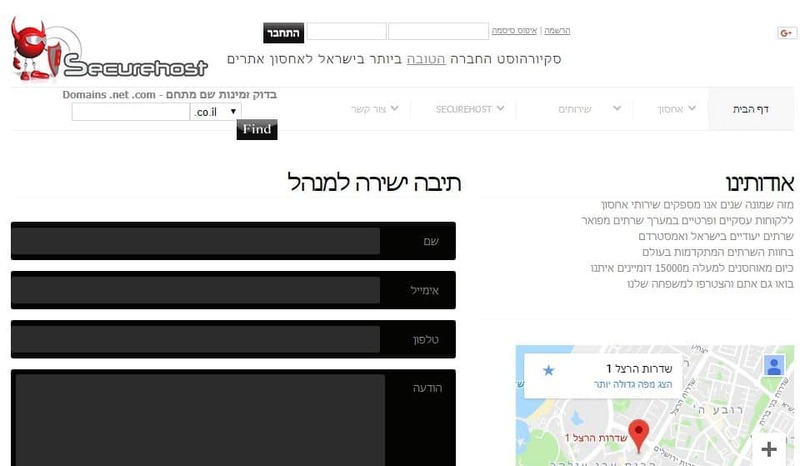 Though this company has a relatively small market share in Israel, the vendor has still managed to accumulate a substantial customer base, already hosting over 15,000 domains. 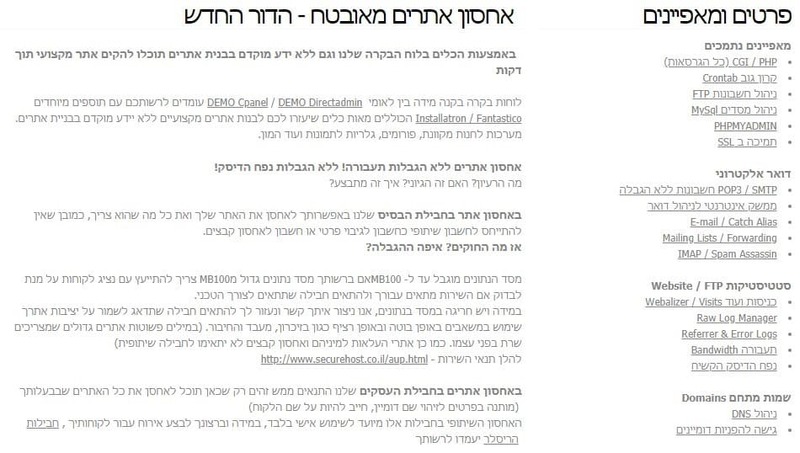 The Securehost website is only available in Hebrew. Securehost provides RAID 1 protected virtual servers. They use Intel Xeon processors including dedicated Intel Xeon E3 and dedicated Intel Xeon Scalable 1245. This provides high performance and reliability. I was particularly captivated by this vendor’s backup services. Securehost allows users to combine a high-end external backup system with each of its hosting plans in addition to local backups. The vendor offers backup services in two levels: daily backups and weekly backups performed on a selected day of the week. What’s more, the firm’s backup system allows access to the saved files and data through a secure password as it provides full FTP access to the external backup server. Its backup system is especially ideal for dedicated, virtual, and reseller services. The vendor provides the latest and most advanced internet protocol, IPv6 for fast loading of the websites it hosts. In addition to offering shared hosting solutions, Securehost offers SSL certificates, domain name registration services, radio servers, security and professional consulting, website building, and SQUID proxy servers. Securehost hosting plans are reasonably priced, especially if you consider the resources and features included. The prices are listed in Israeli shekel. The vendor offers flexible billing cycles, which include monthly, quarterly, semi-annual, and annual cycles. Securehost hosting solutions include a monthly network uptime guarantee of over 99.9% but include no money-back guarantee. If you need technical assistance, you can contact the Securehost support desk via phone or ticketing system, though there is no live chat or support email. Securehost says that its support team is available 24/7. However, customers complain incessantly about its failure to respond to the queries they send. I opened a ticket on its website but never heard back from them. The Securehost website includes a knowledge base with a considerable number of articles and tutorials. Securehost’s reasonably-priced hosting solutions are ideal for businesses of all sizes. However, its apparent failure to invest in a functional and competent support team is, perhaps, its greatest undoing. The company could also gain a little more footing in the Israeli hosting space if it added some incentives in its hosting such as an uptime guarantee and a money-back guarantee. Wondering how Securehost stacks up against other Web Hosting companies? Enter any other Web Hosting company and we will give you a side-by-side comparison.